Merritt Bakery Fire, originally uploaded by in2jazz. A two-alarm blaze in Oakland has damaged a grocery store and restaurant, a city fire official said today. Firefighters responded at 6:54 a.m. to an alarm call at a strip mall in the 200 block of East 18th Street, said Oakland fire department Lt. Melinda Drayton. A second alarm was called in at 7:01 a.m. The fire was placed under control at 7:19 a.m. No firefighters or civilians were hurt. 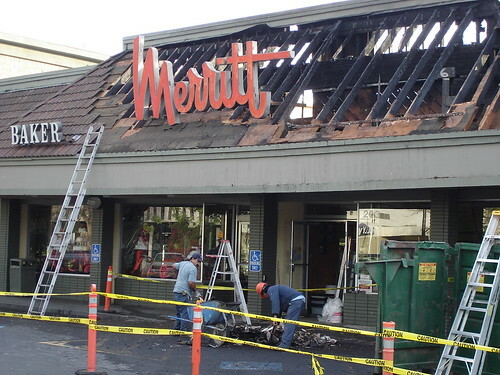 The site contains an Albertson’s supermarket, which Drayton said suffered some damage, and the Merritt Restaurant and Bakery. No damage estimate was immediately available, but Drayton said she believed the restaurant was not likely to open anytime soon. The city health department is also investigating, as is standard procedure for restaurant fires. UPDATE: Merritt Restaurant and Bakery reopened the next day for business. You are currently viewing the archives for February, 2006 at Simply J Life.